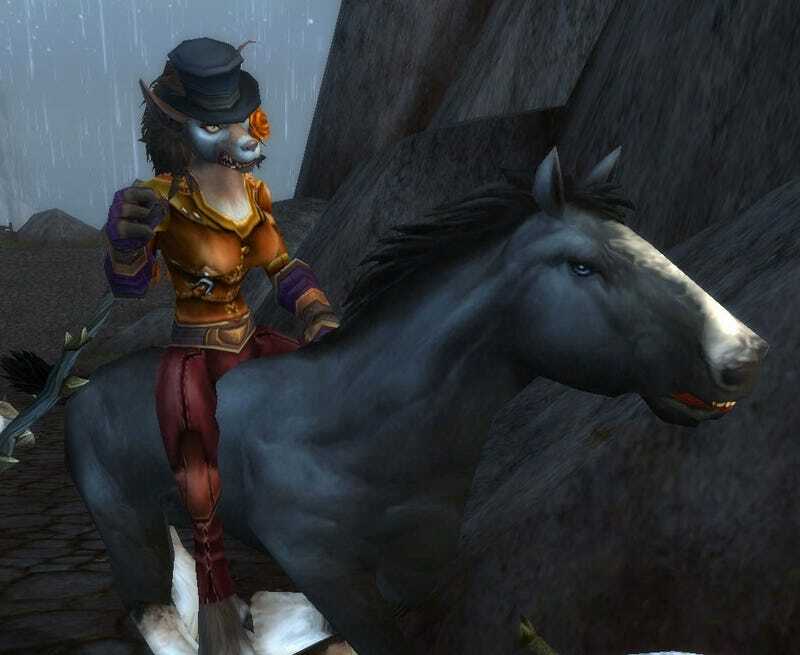 It's been a week since Blizzard unleashed the Cataclysm in World of Warcraft, and I spent the past seven days getting to know the Goblins and the Worgen. Which one did I prefer? Kotaku's MMO reviews are a multi-part process. Rather than deliver day one reviews based on beta gameplay, we play the game for four weeks (or in this case, two) before issuing our final verdict. Once a week we deliver a log detailing when and how we played the game. We believe this gives readers a frame of reference for the final review. Since MMO titles support many different types of play, readers can compare our experiences to theirs to determine what the review means to them. I'm going to try a slightly different format this time around. Instead of keeping a running journal of every single moment I spent in the game, I'm going to summarize. It's easier to read, easier to write, and works just fine. Upon launching Cataclysm for the first time early Tuesday morning, I created a pair of characters using the class suggestions voted on by our readers: One Goblin Rogue named Pokery, and a Worgen Druid I dubbed Quality. I played the Goblin Rogue through the new starting area, which took me through level 11, and then spent three more levels adventuring in the Azshara region outside of Orgrimmar. Then I moved on to the Worgen Druid, leveling her through the starting area reaching level 12, and then I got sort of carried away. She's now a level 29 Balance Druid. The new race starting areas had definitely improved since I last saw them in early beta form. Those early experiences were compelling enough, but now with new music in place, new game mechanics tweaked, and the cinematics all present and accounted for, the experience is quite immersive and enjoyable. The Goblin starting experience is whimsical and fun, in a dark sort of way. The Goblins are fun-loving criminals, gleefully going about the business of extortion, racketeering, loan sharking, and the odd instance of insurance fraud. Even as the dragon Deathwing tears his way out of the center of the planet, raining fire down upon the Goblin's technology-covered island the scheming continues; as the tiny island was being destroyed I was handing over my life savings in exchange for safe passage. The action then moved to another island, where the Goblins struggle to survive after their ship was damaged in a battle between Alliance and Horde forces. As I progressed through the quest chain the bond between the Goblins and the Hordes forces on the island grows, culminating in this one particular Goblin faction signing up. The overall tone of the Goblin starting zone is humorous and light-hearted. The story is well constructed, and I found myself getting attached to the cast of characters that followed me through the adventure. Once off the island my questing continued in Azshara, previously a level 40 or so zone restructured in the recent world-changing patch as a zone for characters ten and above. I fought some Blood Elves and screwed with some Naga before reaching level 14 and calling it quits. Why such an early end to my Goblin adventures? I blame our readers. I told them I had extensive Rogue experience, but they voted Rogue anyway. Despite a wide array of interesting quests involving gimmicks like mechs, shark submarines, and a giant turtle-slaying rocket launcher, I was just playing a Rogue again, and I knew what to expect. What I didn't expect was loving the new Alliance race so much. The Worgen can transform between human and werewolf form at will. As a Balance Druid, that gives me what, seven different forms at level 29? Human, Worgen, bear form, cat form, travel form, aquatic form, and Moonkin form. Later I'll get flying form. That's a lot of transforming. I didn't really enjoy the Worgen starting area in beta. It wasn't nearly as entertaining as the Goblin starting area, and overall it didn't feel very new. I don't know what changed between then and now, but I found myself drawn into the storyline much deeper during my post-release playthrough. Worgen start off as humans living in the sealed-off city of Gilneas. They spend the first five levels of existence fighting against the Worgen that seemed to have invaded. The quest lie took me all over the city, culminating in a massive battle at the town chapel that our side ultimately lost. When I woke up I was a Worgen, half-man, half-wolf. The rest of my time in the starting area was spent in an effort to win back Gilneas from the Undead Scourge as part of a joint human and Worgen effort. It's a decidedly darker storyline than the Goblin one. The themes presented are deeper and the plot points more mature. I was compelled to see how these new creatures integrated themselves into Alliance culture. Once out of the starting zone I found myself outside of the Night Elf capital city of Darnassus, which makes sense seeing as the Worgen are the only Alliance race besides the Night Elves that can become Druids. The quest line that takes players from the Darkshore zone into Ashenvale is truly epic. Darkshore was torn apart by the Cataclysm, so much so that prominent Warcraft figures like Illidan's brother Malfurion Stormrage get personally involved. It was so compelling that I made it all the way to level 29 before realizing I should probably start getting my high level mage ready to explore the level 80 and above zones that make up the other half of the expansion. When Blizzard introduced the Death Knights to World of Warcraft they created a compelling new character experience that put all other starting zones to shame, with unparalleled storytelling and unique game mechanics. With the introduction of the Goblin and Worgen they've bested themselves. The starting experiences for both races don't merely introduce the player to the world; they introduce the entire race to the world, making sure the player knows their place in Azeroth. Next week I'll take a look at the new level 80 and above content. Let's see how quickly my level 76 Mage can become a level 80 Mage. If anyone has leveling tips, feel free to pass them my way!